We'll admit it: we like a good rumor here at Biker News. Sometimes those rumors turn out to be true, such as the time we gave you the scoop on the Kawasaki Vulcan S more than a month before it was revealed to the rest of the world. Wheraes other rumors, like talk of an electric cruiser from Brammo, have yet to pan out. So, it's important to take any rumor with a grain of salt. Exhibit A: Polaris says Victory will focus on performance. Victory, of course, is owned by Polaris -- the same Minnesota-based company that owns Indian Motorcycles. 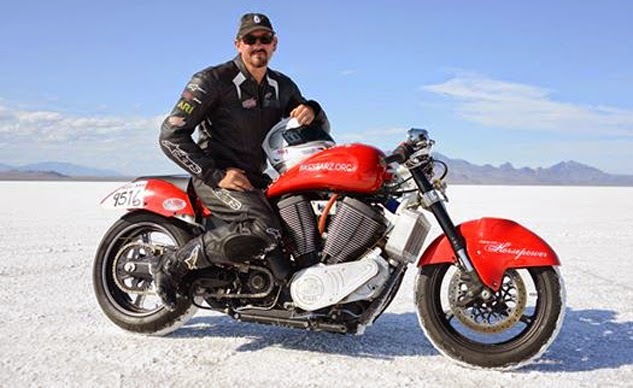 When Indian launched its Chief Classic, Chief Vintage and Chieftain models in 2013, Polaris VP Steve Menneto told members of the press that the presence of Indian would allow Victory to "really go all out" in terms of performance. Exhibit B: Retooling at Spirit Lake. Earlier this year, Victory cancelled an annual gathering of riders at its manufacturing plant in Spirit Lake, Iowa. The reason given was that the plant (which also produces models for Indian) was in the process of retooling. This suggests new and different things ahead. When the 2015 model year line up was announced this summer a number of popular models were conspicuously absent, such as the Judge and Boardwalk. Perhaps this is because Victory is "making room" for forthcoming models. Exhibit D: Those mystery sketches. Truth is, the rumor of a liquid-cooled Victory is not a new one. Back in April Motorcyclist published leaked sketches for four different water-cooled models. However, a few months later we all discovered that one of those sketches was, in fact, the new Indian Scout. But what about the other three sketches? Exhibit E: Motorcycle journalists have been expecting it. Shortly before the 2014 Sturgis Bike Week, Victory announced its "new" Magnum model -- effectively just a Cross Country with a few minor cosmetic changes. If you read reviews of the bike, you'll notice that most journalists had been expecting to be presented with something entirely different. One of the lesser reported bits of news from the Intermot motorcycle show (which took place in October) was the fact that Victory added anti-lock brakes to the European versions of its Gunner models. This is because EU regulations will require the feature on all new motorcycles sold in Europe from January 1, 2015. By adding this feature, Victory has shown it wants to play ball in the European field. We think it's safe to assume that if it's going to play by EU rules in 2015, it will do so again in 2016 when new, tougher emissions standards will be introduced. Many people believe those standards will effectively kill the classic air-cooled V-twin in Europe. Exhibit G: Victory is teasing high-performance machines. In the past few weeks, Victory has put out two interesting videos on its YouTube channel featuring Victory models receiving performance upgrades. In one video, a Hammer is kitted with liquid cooling to help it set a record at the Bonneville Salt Flats. In a second video, a Cross Country is equipped with a cooling unit to help boost engine output by roughly 80 horsepower. This sudden social media focus on aftermarket upgrades is very similar to something Victory has done before. In the months leading up to the release of the Magnum, Victory used its Facebook, Twitter and Instagram feeds to highlight a number of custom bagger builds that featured a large front wheel -- in other words, bikes that looked a lot like the Magnum. So, there you have it, ladies and gentlemen of the jury. We think this evidence all adds up to a new liquid-cooled Victory being released before the beginning of the next riding season. Quite possibly one that is performance oriented. Exactly what it will look like, however, is something we'll just have to wait to see.